This lease was designed for a manufacturing tenant occupying all of the space in a single industrial building. The tenant is entitled to two fixed rent renewal options. This lease agreement also contains a work letter for improvement of the premises with a construction allowance provided by the landlord. Any construction costs in excess of the allowance are the responsibility of the tenant. 1. 1 GRANT. Landlord, for and in consideration of the rents herein reserved and of the covenants and agreements herein contained on the part of Tenant to be performed, hereby leases to Tenant, and Tenant hereby lets from Landlord, the real estate commonly known as ­­­­­­­­­­­­­­­­­­­­_____________, __________, __________ and legally described on an exhibit which is attached hereto, identified as Exhibit A, together with all improvements now located thereon, or to be located thereon during the term of this Lease, together with all appurtenances belonging to or in any way pertaining to the said premises (such real estate, improvements and appurtenances hereinafter sometimes jointly or severally, as the context requires, referred to as 'Leased Premises"). Anything contained herein to the contrary notwithstanding, the grant as set forth in this Section 1.1 and all of the provisions of this lease are subject to the acquisition by Landlord of title to the fee of the Leased Premises not later than ______________. If such acquisition has not occurred by said date, this Lease shall be void and of no force and effect and the parties shall not have liability to each other. The date that Landlord acquires fee simple title to the Leased Premises is hereinafter referred to as the "Commencement Date". 1. 2 TERM. The term of this Lease shall commence on the Commencement Date and shall end on the last day of ___________ unless sooner terminated or extended as herein set forth. 1. 3 AGENT. As used in this Lease, the term "Agent" shall mean the agent of Landlord. Until otherwise designated by notice in writing from Landlord, Agent shall be _______________________. Tenant may rely upon any consent or approval given in writing by Agent or upon notice from Agent or from the attorneys for Agent or Landlord. 1. 4. BASIC LEASE PROVISIONS. (a) Purpose (See Section 3.1): Manufacturing, and incidental office, warehouse, and distribution uses. (c) Payee (See Section 4.1): __________. (d) Payee's Address (See Sections 4.1 and 4.2): _______________________. (e) Form of Insurance (See Article VI): The insurance specified in Sections 6.2.1 and 6.2.2 shall comply with the provisions of Section 6.3. (g) Tenant's Address (for notices) (See Section 21.4): Prior to the Commencement Date: _________________________, and thereafter to the Leased Premises. (h) Landlord's Address (for notices) (See Section 21.4): ____________________. (j) Guarantor's Name and Address (See Separate Guaranty) None. (k) _________ Monthly payment for Expenses (subject to reconciliation as provided under Section 9.1(b): $_______________. (m) __________ Monthly payment for Insurance Premiums (subject to reconciliation as provided under Section 9.1(b): $________. 2. 1 POSSESSION. Except as otherwise expressly provided herein (or by written instrument signed by Landlord or Agent) and except for Landlord's Construction (as defined in Section 22 hereof), Landlord shall deliver possession of the Leased Premises to Tenant on the Commencement Date in their condition as of the execution and delivery hereof, reasonable wear and tear excepted. 3. 1 PURPOSE. The Leased Premises shall be used and occupied only for the Purpose set forth in Section 1.4(a) hereof, except that no such use shall (a) violate any certificate of occupancy or law, ordinance or other governmental regulation, or any covenants, conditions or restrictions of record, in effect from time to time affecting the Leased Premises or the use thereof, (b) cause injury to the improvements, (c) cause the value or usefulness of the Leased Premises or any part thereof to diminish, (d) constitute a public or private nuisance or waste, (e) authorize Tenant to use, treat, store or dispose of hazardous or toxic materials on the Leased Premises (except in accordance with Article XIII below), or to render the insurance on the Leased Premises void or the insurance risk more hazardous. Tenant shall do no outside storage. 3. 2 PROHIBITION OF USE. 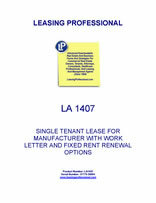 If the use of the Leased Premises should at any time during the Lease term be prohibited by law or ordinance or other governmental regulation, or prevented by injunction, this Lease shall not be thereby terminated, nor shall Tenant be entitled by reason thereof to surrender the Leased Premises or to any abatement or reduction in rent, nor shall the respective obligations of the parties hereto be otherwise affected. 4. 1 ANNUAL BASE RENT. Beginning on _____________ (the "Rent Commencement Date"), Tenant shall pay Annual Base Rent as set forth in Section 1.4(b) hereof payable monthly in advance in installments as set forth in said Section. Annual Base Rent, additional rent and other charges payable hereunder (collectively "Rent") shall be paid to or upon the order of Payee at the Payee's address. Landlord shall have the right to change the Payee or the Payee's Address by giving written notice thereof to Tenant. If Tenant occupies the Leased Premises for the purpose of conducting business therein prior to the Commencement Date, Tenant shall pay Rent on a pro rata basis from the date of occupancy to the Commencement Date. All payments by Tenant shall be made without deduction, set off, discount or abatement in lawful money of the United States. 4. 2. LOCK BOX. Landlord may from time to time designate a lock box collection agent for the collection of rents or other charges due Landlord. In such event, the date of payment shall be the date of receipt by the lock box collection agent of such payment (or the date of collection of any such sum if payment is made in the form of a negotiable instrument thereafter dishonored upon presentment); however, for the purposes of this Lease, no such payment or collection shall be deemed "accepted" by Landlord if Landlord thereafter remits a check payable to Tenant in the amount received by the lock box collection agent or, in the case of a dishonored instrument, within 21 days after collection. Neither the negotiation of Tenant's negotiable instrument by the lock box collection agent, nor the possession of the funds by Landlord during the twenty-one (21) day period, nor the return of any such sum to Tenant shall be deemed to be inconsistent with the rejection of Tenant's tender of such payment for all purposes as of the date of Landlord's lock box collection agent's receipt of such payment (or collection), nor shall any of such events be deemed to be a waiver of any breach by Tenant of any terms, covenants or conditions of this Lease nor a waiver of any of Landlord's rights or remedies. 4. 3 INTEREST ON LATE PAYMENTS. Each and every installment of Rent which shall not be paid when due shall bear interest at a rate per annum equal to five percent (5%) in excess of the announced base rate of interest of __________ Bank in effect on the due date of such payment, from the date when the same is payable under the terms of this Lease until the same shall be paid. Landlord and Tenant as of the Rent Commencement Date for the first year of the Lease term and as of the expiration of the Lease term for the last year of the Lease term (and shall be paid by Tenant upon such expiration based on Landlord's reasonable estimate thereof and reconciled within sixty (60) days after the final amount of Impositions is determined for such year). Impositions shall also include fees and costs incurred by Landlord during or prior to the Lease term for the purpose of contesting or protesting tax assessments or rates, to the extent such fees and costs do not exceed savings realized during the term of the Lease and any extension thereof. The benefit of the provisions of any statute or ordinance permitting any assessment to be paid over a period of years shall be taken, and Tenant shall be obligated to pay, in the manner provided below, only those installments falling due during the term of this Lease. 5. 2 ALTERNATIVE TAXES. If at any time during the term of this Lease the method of taxation prevailing at the commencement of the term hereof shall be altered so that any new tax, assessment, levy, imposition or charge, or any part thereof, shall be measured by or be based in whole or in part upon the Lease, or the Leased Premises, or the Annual Base Rent, additional rent or other income therefrom and shall be imposed upon the Landlord, then all such taxes, assessments, levies, impositions, or charges, or the part thereof, to the extent that they are so measured or based, shall be deemed to be included within the term Impositions for the purposes hereof to the extent that such Impositions would be payable if the Leased Premises were the only property of Landlord subject to such Impositions, and Tenant shall pay and discharge the same as herein provided in respect of the payment of Impositions. There shall be excluded from Impositions all federal income taxes, state and local net income taxes, federal excess profit taxes, franchise, capital stock and federal or state estate or inheritance taxes of Landlord. 5. 3 RIGHT TO CONTEST. Tenant may, in good faith and with due diligence, contest Impositions by appropriate legal proceedings which shall have the effect of preventing the collection of the Imposition so contested; provided that pending any such legal proceedings, Tenant shall give Landlord such security as may be deemed reasonably satisfactory to Landlord to insure payment of the amount of the imposition and all interest and penalties thereon. Nothing in this section shall excuse Tenant from making the monthly deposits for Impositions set forth in Section 9.1(b) below. If, at any time during the continuance of such contest, the Leased Premises or any part thereof is, in the judgment of Landlord, in imminent danger of being forfeited or lost, Landlord may use such security or deposit for the payment of such Imposition.